After plenty of teasing and speculation, LG has finally taken the wraps off the LG G4! The LG G4 might not have a metallic or glass unibody design like we’re seeing from much of the competition these days, but it does make some interesting changes in aesthetics, hardware, and software. It’s also important to note that the G4 is, so far, the only major flagship in 2015 to offer a removable battery. 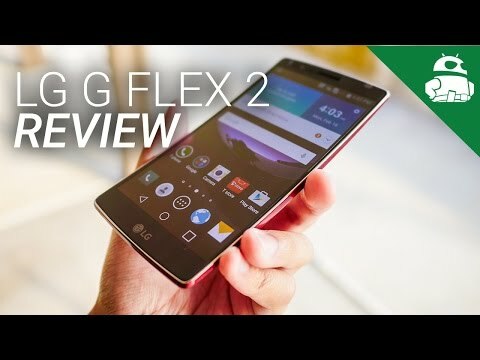 So how does the LG G4 compare to some of the other major flagships released this year? For this quick comparison, we’ll be taking at look at how Apple’s iPhone 6 compares to LG’s latest and greatest. Most major OEMs are ditching plastic builds, instead favoring metal or glass unibody designs, but LG has gone a completely different route with its new flagship. The LG G4 features a removable genuine veggie-tanned leather back that is available in multiple different colors, complete with vertical stitching across the middle of the back. The new design not only is cosmetically appealing to some, it also aids in the grip and helps keep temperature extremes in check. You certainly won’t have to worry about your hands getting too hot while holding it, at least. For those that aren’t swayed by the new leather design, LG is also offering black, gold, and white plastic versions with the former packing a titanium finish and the latter two offering ceramic finishes. As you can see, for this comparison we managed to get our hands on the black titanium finished edition. In addition to the new rear design options, the LG G4 also makes the move to a curved display. The curve here is really subtle in nature, but it does afford the G4 improved durability like we’ve seen from the G Flex series. Aside from these changes, much of LG’s design language remains the same with the LG G4. The iconic rear power and volume button setup returns with the LG G4, and the front of the phone once again is greeted by a near bezel-less display. Turning to the Apple iPhone 6, Apple continues its recent legacy of minimalist unibody metal designs, offering the familiar single home button on the front with an integrated fingerprint scanner. Like the LG G4, the iPhone 6 isn’t a massive departure in design from its predecessor, though the display size took a sizable hike upward and the aesthetics have been further refined. Probably the main design cues that differentiate these two phones is that the LG G4 does a have removable back, which means that the G4 has a replaceable 3,000 mAh battery unit and expandable storage. Both the LG G4 and iPhone 6 are premium devices in their own right, but ultimately it comes down to personal taste as to which phone is the more attractive one to you. Large screens have been the name of the game for a while now in the world of Android, but with the latest iPhone Apple has finally caught up, offering a 4.7-inch IPS LCD display with a resolution of 1334 x 750 on the iPhone 6 and a 5.5-inch 1080p display with the iPhone 6 Plus. While the iPhone 6 and 6 Plus provide an adequate viewing experience, for those that subscribe to the bigger-is-better philosophy when it comes to displays, the 5.5-inch QHD display on the LG G4 is certainly a more impressive screen. The resolution and size may be the same as found on the LG G3 but the screen has been further improved thanks to LG’s new Quantum Display technology, which passes colors through a specific phosphor layer to achieve its RGB coloration. LG’s latest display was designed to rival the DCI standard found in general television and cinema. While super AMOLED oversaturates colors past the DCI standard, the G4’s display hits 98% of the mark. Display experiences on both phones already look quite great, but the G4 has a higher resolution QHD display that has been further enhanced this time around giving it a pretty noticeable edge over the iPhone. Considering the differences in software and optimization, looking at the specs doesn’t tell the full story when comparing devices from these two very different ecosystems. That said, optimization continues to improve in the Android camp, making the vast differences in hardware more noticeable than they once were. The iPhone 6 features a 1.4GHz A8 chip with just 1GB RAM, which is far from impressive in 2015 as far as Android devices are concerned, but still more than enough to provide a solid iOS experience. As for the LG G4, you get a Snapdragon 808 with 3GB RAM. The 808 might not sound as impressive as the 810 used in the LG G Flex 2, but LG worked very closely with Qualcomm to ensure that the Snapdragon 808 was as optimized as possible for the G4. 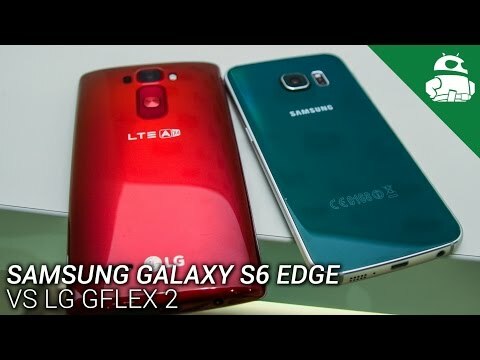 The end result is a smooth Android experience that so far appears to be much better than what we saw with the G Flex 2. In terms of other hardware features, the iPhone 6 is available in 32, 64, and 128GB flavors with no expandable storage. The LG G4, on the other hand, only comes in 32GB but is further augmented by a microSD card slot. The LG G4 also has a replaceable battery, thanks to the phone’s removable back, which LG claims can get close to 20 hours of talk time. The LG G4 might one-up the iPhone in terms of storage, thanks to the microSD slot, but the iPhone does have the advantage of packing a fingerprint scanner. Whether that’s a big deal probably is a matter of opinion, though we certainly aren’t all that upset by the omission. Apple tends to shy away from the megapixel race that we see in the Android camp, offering a modest 8MP rear shooter that actually performs quite admirably despite not impressing on paper. The iPhone 6 adds a better sensor, an auto focus system called Focus Pixels, and software-based optimization. The LG G4 offers a much more noticeable upgrade over its predecessor, jumping from a 13MP rear shooter to 16MP. More than just megapixels, the LG G4 offers a f/1.8 aperture package that one-ups its competition, offering a larger sensor than any other flagship device currently out there. The LG G4 also offers OIS technology and a color spectrum sensor that will analyze scenes to help achieve the right white balance automatically and accurately. Another standout feature for the LG G4 is the manual mode found in its camera software, which gives you all the big features photographers would typically find in full cameras including a lot of ISO stops, manual focus, a full white balance gamut, a histogram, and even the ability to shoot RAW and JPEG simultaneously. 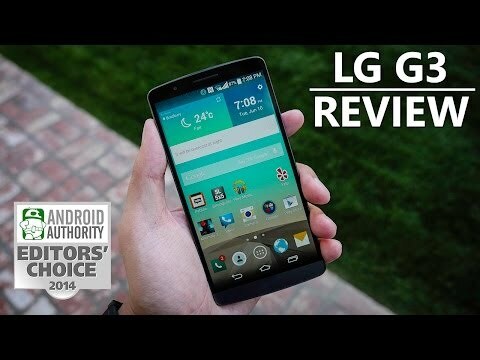 We haven’t had enough time with the LG G4 to make a definitive statement about how it performs against the iPhone 6, but we certainly like what we see so far and look forward to spending more time with the camera in the weeks to come. Apple’s iPhone 6 is powered by iOS 8, which is aesthetically similar to iOS 7 but introduces new features like Apple Pay, improvement to iCloud, a new Health app, improved notifications, third party keyboards, and more. iOS receives a lot of positive attention from its fans for its ease of use, its quick updates, and the hardware-software optimization Apple puts into its product. Obviously it is too early to talk about LG’s quick update prowess, but LG has put a lot of effort into optimizing their software. While the G UI looks very similar to what we saw with the G Flex 2 and earlier LG flagships, lag and stutter are now at a minimum and the whole UI feels much snapper than past iterations. In addition to optimizing the experience further, LG has also added a few new features including an enhanced calendar that can save captures from most parts of the phone as reminders, a more powerful gallery app that groups photos into memories, and several other changes that we’ll get into more detail with in our full review in the weeks to come. It’s also worth mentioning that LG has really worked hard with Google to provide an almost Nexus-like experience when it comes to software, with Chrome as the default browser, Google Drive integrated across LG apps, and numerous LG apps also play nicely with Android Wear. There’s also a free 100GB Google Drive storage for two years. 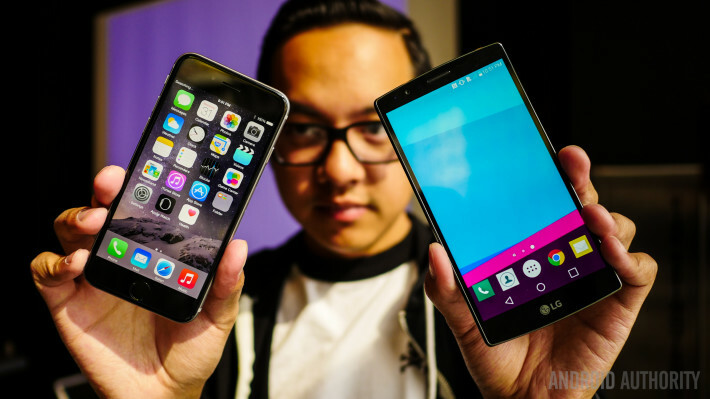 And so there you have it — the LG G4 vs the iPhone 6. Stay tuned, as we’ll be taking a closer look at how the LG G4 compares to the iPhone 6 in a full versus in the weeks to come. Stay tuned for even more at the LG G4 launch event in NYC, and for more from Android Authority! 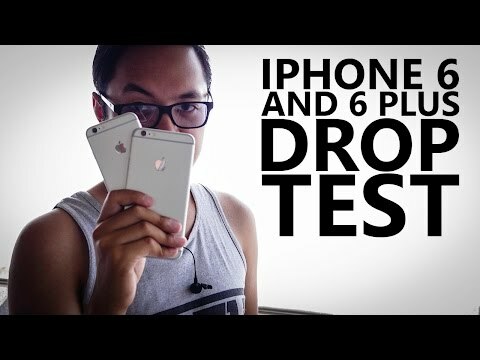 iPhone 6 and 6 Plus Drop Test!